About a month after moving outdoors for the summer, Burlington Farmers Market is starting to bring some serious vegetables (and this past weekend, unbeatable weather) to City Hall Park. 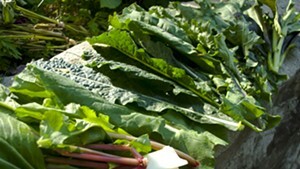 Saturday bore witness to early zucchini, baby beets and fresh, crisp lettuces and greens galore. 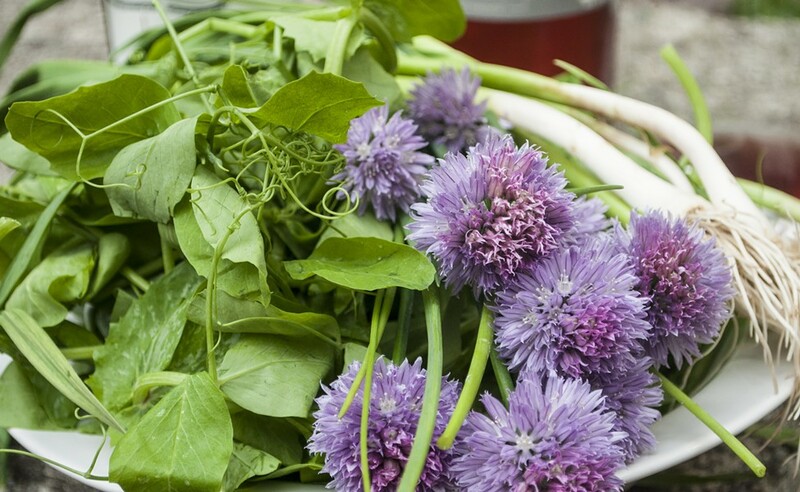 I'm a sucker for pretty produce, so I couldn't resist a fat bag of spindly pea shoots or a bouquet of flowering chives from the Intervale's Half Pint Farm. I also just had to have a bundle of gorgeous green garlic from Sue Wells. 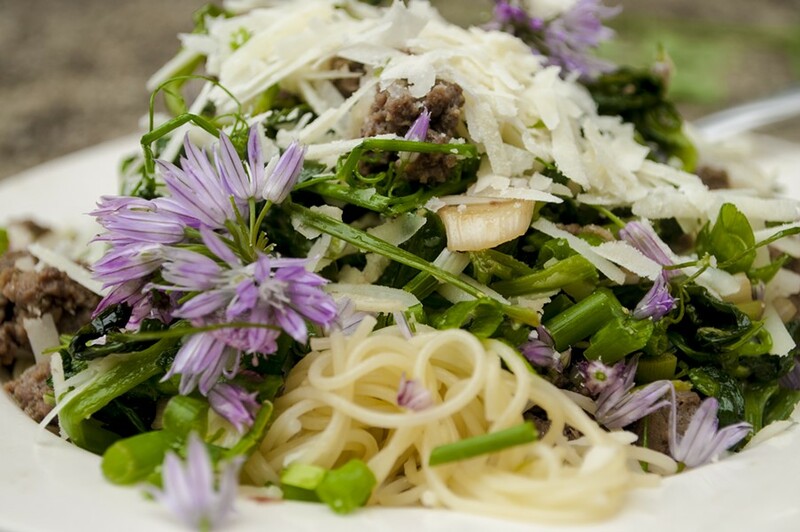 These ingredients alone don't make for much, but sautéd briefly and tossed with crumbled pork product (I went with wild boar sausage from D'Artagnan, which can be had for about $6 at Price Chopper, but any sweet, uncooked sausage will do) and pecorino, they make a beautiful pasta. Vegetarians can make the same dish sans meat — the greens, cheese and oniony fronds pack plenty of flavor. Get the recipe after the jump. Salt and boil water for pasta. Pull the sausage from its casings and fry in a shallow pan over medium heat, breaking the meat apart with a spatula until it's crumbled and completely cooked; set aside in a covered bowl, reserving any liquid. Boil the pasta, strain, drizzle with a splash of oil and cover to keep warm. Heat oil in a large pan over medium heat, add sausage (and its liquid) and diced green garlic. 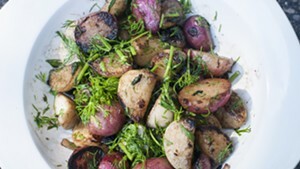 Cook for 1-2 minutes, then add the pea shoots, half of the chives and the long ends of the garlic leaves. Sprinkle with salt or tamari (if desired) and cook 2-3 minutes, stirring often, until the greens are thoroughly wilted but still firm. 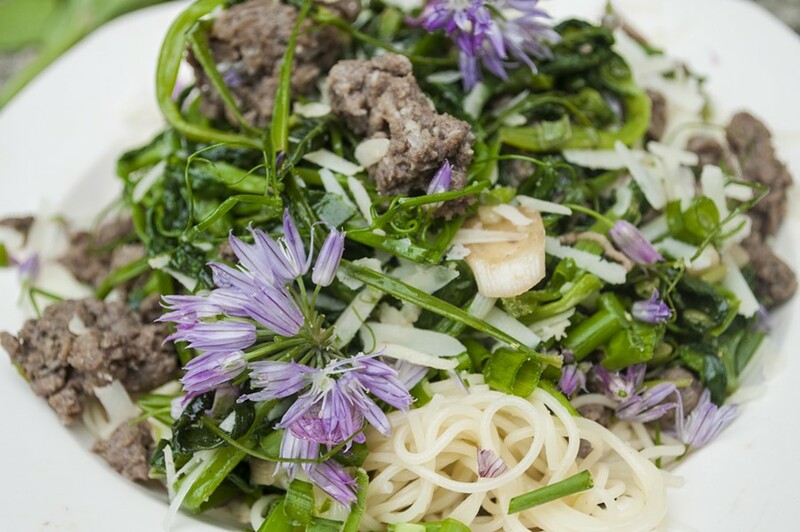 Portion pasta into plates, top with sausage and greens, garnish liberally with cheese and the remaining raw chives and serve immediately.